Once September rolls around only one or two teams will deem their year as being successful. In 2015 Dublin had a year of years winning the league, Leinster and the All Ireland (do we throw in the O’Byrne cup?). Monaghan winning Ulster made for a successful season whilst there is an honourable mention for Fermanagh with promotion to Division2 and the quarter final appearance. But what about the rest? If the league is a means to an end for the majority, and the All Ireland and Provincial championships are regularly shared by the same teams, how do we measure the remainder’s performance? Or indeed how do we judge a team like Tyrone that got relegated, fell short in Ulster but rallied to get to the All Ireland semi-final? One way is to compare a team’s results against how bookmaker’s thought they should fare. Bookmakers give odds on all games. The main markets are match odds and handicap. Any bookmaker worth their salt will tell you that though all odds can be converted into a percentage chance of winning this is not their primary aim when setting the line. They are not trying to exactly predict the likelihood of an outcome but rather set a line that will encourage multi way action on the game. This then enables them to have relatively evenly split betting on all outcomes and they can take the built in margin. Still these lines are a very good proxy for how a team is expected to perform and the cumulative odds can thus be used to extract just how many games a team won above, or below, what was expected. Thus we create an Expected Wins (Exp Wins) metric. It comes as no surprise that seven of the top ten teams in pure win percentage appear in the top ten based on Exp Wins. Fermanagh and Monaghan are up there given their aforementioned successful seasons. Longford also had a good year winning 9 of their 13 games. In fact on pure winning percentage they finished second in the country behind Dublin’s 75%. But what of the remainder? The biggest surprise by far was Limerick. They only won three games in total, ranking them in the bottom third on pure wins alone, but were 7th when compared to their Exp Wins. How so? They were the outsider in all seven of their league games but won three. From those seven games the bookmakers expected them to win 1.87. They outperformed their expected wins by more than a full game. In the Championship they lost by two points away to Clare in a game that had Clare favoured by two and then walked into Tyrone in the first round of the back door. 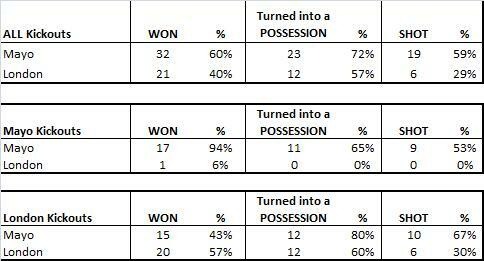 The positive Exp Win total they accumulated in the league was not too badly dented by these two losses – especially the Tyrone one where they were huge outsiders. Sligo were a bit of a surprise given that they only won four games but again they were quite large underdogs when beating Roscommon in the Championship and complete outsiders in the next two games against Tyrone & Mayo. Given the very low combined Exp Wins from those three games (0.39) that one victory against Roscommon puts them in positive territory for the Championship alone. Again six of the teams that appeared in the Exp Wins top ten re-appear. A number of the teams, such as Limerick, Sligo, Fermanagh & Monaghan we have touched upon previously but there are a few surprises. 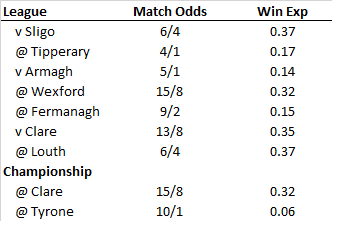 Mayo, despite being a very high profile team, would have been a profitable one to follow on the handicap. Cork, for all the negativity following the losses to Kerry & Kildare, were also profitable but it is London & Leitrim that jump out. Between them they won four games all season but it could be argued they had a pretty good year; their performance exceeded expectations in 12 of their combined 18 games. London only won one of their nine games all year but managed to cover the handicap on six occasions. Narrow that further and they covered the handicap in five of their seven league games including all three that they played away. You would never state that London had a good season but from a performance perspective we should probably cut them some slack. They performed well above expectation. Originally the above table was going to be the bottom five but I expanded it to catch two of the bigger fish. Some of the lower lights – Carlow, Wicklow & Waterford – being down here is not really a surprise given just how few games they won. However it does indicate that perhaps the bookmakers were generally over rating them despite their poor form. Laois were particularly poor but looking purely at their Championship form they beat Carlow when their Exp Win was 0.86 so get very little credit for that and then had a further three games failing to win any of them when the combined Exp Win was 1.75. Given they were relegated from Division 1 with just the one win from seven it is perhaps no surprise to see Tyrone down here. Three of those that appeared in the worst Exp Win table re-appear when we look at the worst performances against the handicap. Wicklow and Waterford not only failed to win enough games but also played poorly in their losses covering a combined four handicaps over 18 games. Given that they won seven games but were only an outsider once during the year – and that a slight outsider in the final against Dublin – it is no surprise that Kerry are again represented. They had, all told, a good year but were consistently over valued by the bookmakers. Or conversely the bookmakers kept their odds short as the public’s perception of Kerry was that they were performing better than they actually were. Note 1; there can be quite a difference in bookmaker’s odds. The odds used for this piece were taken primarily from Paddy Power rather than taking the best prices available across all bookmakers. The main reason for this was laziness on my part as it meant just one source rather than hopping around sites. When you take the price can also be important. Lines do move. However they were generally taken on Saturday or Sunday morning when any early moves had been accounted for. Note2; generally speaking the margin on GAA match odds is 109% with lesser games getting up to 112%. A typical line in a close game would be 10/11 (home team), 15/2 (draw) & 6/5 (away team) which equals a book of 109.6%. To make this, and all games, come in at 100% – and remove the bookmaker’s margin – I extracted 3% from each outcome. There is a valid argument that this should be more nuanced (take less off the draw perhaps) but for now it’s fine. The home team has a 52.4% chance of winning on the odds. We know this is inflated to account for the bookmaker’s margin. Take 3% away from each of the three outcomes to account for this and the home team now has a 49.4% chance of winning. So using the above quoted odds we get an Exp win of 0.49 for the home team (priced at 10/11) and 0.42 for the away team (priced at 6/5). Do this for all games for a particular team and you have created an Expected Wins metric.